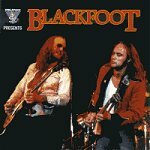 Amongst the mandatory collection of shows being released from the vaults of the King Biscuit Flour Hour none is more worthy of attention than the 1983 live set from the ultimate southern rock gods BLACKFOOT. This CD features the band during the final pinnacle of their career, shortly before their self destruction and plummet from grace into the spewing pits of pointless pop. The tour was in support of the "Siogo" album and Ken Hensley of URIAH HEAP fame had just joined the band to add some nice, but unnecessary, keyboard texture to BLACKFOOT's hard rockin' riffs. Featuring staples like "Train, Train" , "Highway Song", and "Fly Away" this CD captures in vivid (some may say lurid) detail the boundless energy and passion of one of rock's most exciting bands. Rickey Medlocke sings, screams and hollers like a deranged madman. Charlie Hargrett rips his six string to shreds and spews out the thick, down home sound that was his trademark. Jakson and Greg keep the beat driving yet soulful. Ken's organ embellishes everything nicely and he also fleshed things out with a bit of slide guitar. The recording is raw and intense just like their live shows. As a result the album is less polished than the "Highway Song - Live" record which may take some getting used to. In addition to the live set there is the studio cut "Livin' In The City" was previously only available as a b-side and from its sound I'm guessing it is from the "Vertical Smiles" sessions. An interview with Rick Medlock wraps up the disc but unfortunately Rick isn't as articulate and forthcoming as he usually is and the interview cuts off in mid-sentence. Fans of heavy rock, classic rock, or southern rock would be down right foolish to pass on this one.